Sunday night, an era comes to a close when the final episode of Downton Abbey airs in the U.S. on PBS. (It has already been broadcast in the U.K., so no spoilers please, you lucky folks who have already seen it!) You remember your local Public Broadcasting Station, don’t you? You know, those fine folks who air documentaries and other shows for your elderly parents? In my house, PBS had pretty much become a kids-only network—a safe place for my youngins where the cartoons aren’t violent and the characters aren’t back-talking brats. We in the over-30 crowd got our entertainment elsewhere. At least, that was true until 2011 when a British period piece became a smashing success across the pond. How did such a show become PBS’s most watched program in two decades? How about luscious costumes, witty lines, and delightful British accents for starters. At its core, Downton Abbey is a soap opera, filled with drama, sparkling dialogue, and more drama. Don’t believe me? 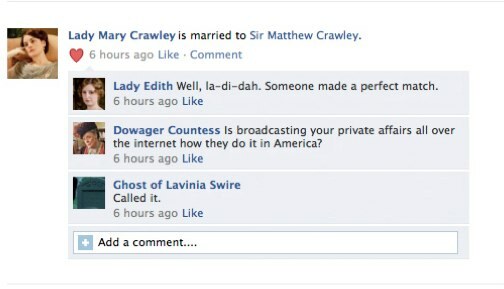 Just consider Lady Mary. The poor woman has had more affaires de coeur gone bad than a leopard has spots. And don’t get me started on unlucky Lady Edith! Her tragic love life is almost as depressing as the relentless calamities endured by the longsuffering John and Anna Bates. Then add a large cast of characters and a glimpse of life in another time, both its good and bad, for both its rich and poor. How big of a phenomenon is Downton? Well, there are the many “Which Downton Character are You?” quizzes such as those here, or here, or here. (All of which claim I’m either the dowager countess or the earl himself, so I guess I’m secretly nobility.) Of course, if you're not careful, you might end up being matched to one of Downton's many dead characters. This LA Times article lists them all. Or mostly all. So Downton, we bid you adieu. Sunday nights will never be the same without you. Great compilation, CJ! I hadn't seen any of these before and although I popped in and out on a couple, for the most part they were very funny and clever. My hubby's an accordion player, so I didn't mind that one although I do prefer the original. Sigh.... sniff.... pass the tissue, please. I will definitely miss Violet and her sharp wit. Bates, Anna, Carson - I'll miss them all. Count me among the mourners. I am devastated. Loved this show from day 1. One of the things I'm enjoying most is how Edith has grown and evolved. She has always wanted to be loved (and one can argue her family didn't do a good job of filling her needs), but look at her now. Has she made mistakes? Countless! But she's grown up now. The show has been so funny, too. Violet's quips.... and last week, when Robert joyously announced, "Edith will outrank us all! Golly gumdrops, what a turn up!" I loved last year's Text Santa, btw. The one with George Clooney. Literally one of the funniest things ever. I will never forget Moseley shaking cocktails and claiming to be too busy to acknowledge Tom. One last note: the products. The Christmas double album is my favorite for the holidays. Choirs, soloists, even Charles Blake and Cora. And when Mr. Carson reads the Night Before Christmas? Perfection.